The Starbucks mogul may be tempted by the electoral success of wealthy businessman Donald Trump. But the ghost of another businessman-president, and the state of the nation, are warnings. Don’t expect the votes of the Sonics fans. If Howard Schultz runs for president, this small but energetic slice of the local electorate would never forget what it sees as his betrayal. Schultz sold Seattle’s NBA team to a group from Oklahoma City in 2006 and the rest is history, and, for us, ashes. He would face more significant obstacles if he sought the presidency, but let’s back up. 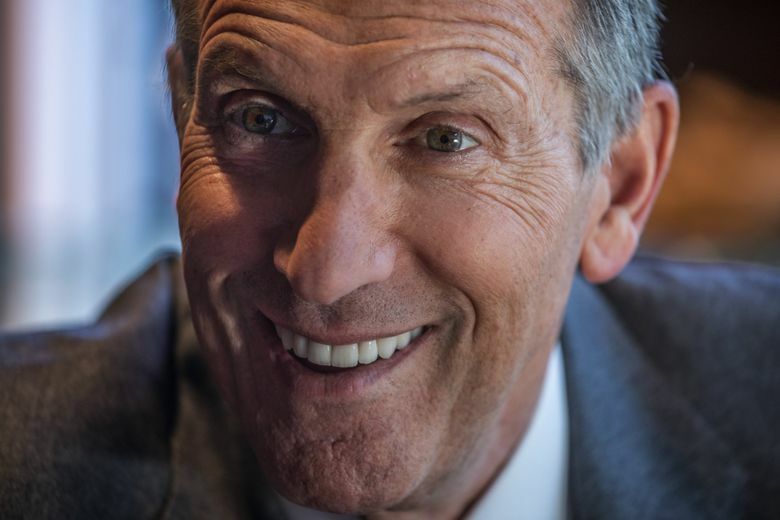 On Monday, Schultz announced his retirement from Starbucks. Rather like Ray Kroc of McDonald’s, many people think Schultz was the founder, although he wasn’t. He did oversee the growth of a seven-store chain into a global powerhouse, provided Seattle with an important headquarters and became rich in the process. Forbes estimates his net worth at $2.8 billion. Schultz is that American icon, the “self-made man.” Never mind that each of us stands on the shoulders of others who helped us — or the bodies of those we betrayed; it’s an enduring mythos. He grew up in public housing in Brooklyn and was the first in his family to go to college. A blacksmith’s son worked his way through Stanford. He went on to earn considerable wealth as a brilliant mining engineer around the world, including in China. His name was Herbert Hoover. This is not a diversion, dear reader, for Hoover’s story is highly relevant to Schultz as he mulls his future. Today we live in a time when business leaders are given hero status on an unprecedented level in American history. One is the sitting president, who is not nearly the innovator and company builder that is Schultz. In Hoover’s day, engineers occupied this pedestal in the public imagination. They built great public works and brought constant improvements to daily life, tamed great rivers with immense dams, banished the primeval darkness with electrification. Many pundits and average citizens began to see modern society, even American self-governance, as mere engineering puzzles. And who better to oversee it than the Great Engineer, Hoover’s popular nickname? Hoover earned the admiration of the nation and world in ways to which Schultz could only aspire. Having made his fortune, Hoover dedicated himself to organizing relief for refugees in World War I. He helped millions of people across Europe, earning another nickname: The Great Humanitarian. Woodrow Wilson appointed Hoover to accompany him to the Versailles peace conference. John Maynard Keynes was so impressed with his intelligence and statesmanship, he said Hoover was the only one who “emerged from the ordeal of Paris with an enhanced reputation.” Hoover opposed the harsh peace that set the table for World War II. This is rather more impressive than growing Starbucks. As Secretary of Commerce under Harding and Coolidge, Hoover was the antithesis of the laissez-faire attitude of the Roaring Twenties. Hoover turned a minor cabinet department into the center of new ideas and relations between government and business. Hoover promoted product standardization, trade and regulation of the public radio airwaves. It drove the dour Coolidge crazy. One of his axioms was, “Four-fifths of all our troubles would disappear if we would only sit down and keep still.” Hoover couldn’t keep still. In 1928, Herbert Hoover was overwhelmingly elected president. A year later, his unraveling began with the market crash that led to the Great Depression. Because of that, his later bitterness, and widespread worshipful history regarding Franklin Roosevelt, all of Hoover’s achievements were forgotten by most Americans. Today, in no small part because of Trump, Schultz may think he can jump into the Oval Office with no political or governmental experience. Several statehouses are led by governors who were businessmen with no public resume. The 2016 GOP primaries included former Hewlett-Packard CEO Carly Fiorina. In 2012, GOP nominee Mitt Romney, although a former Massachusetts governor, staked his claim on business experience. Schultz has not been coy about calling for more civility and common sense in our politics, even if his command of public policy issues is often shaky. For example, he obsessed about the national debt in the CNBC interview, as if that’s the biggest challenge facing this crisis-beset republic. The trouble is that while we should all be nicer, the issues that divide us into a Cold Civil War are real. One person’s common sense is another’s prescription for disaster. Americans can’t even agree on basic facts. The center that Schultz desperately wants to occupy has not held. Writing “Come Together” on coffee cups won’t change that. He supported Hillary Clinton, and has criticized President Trump on such issues as immigration and handling the economy, as well as opposing the Republican tax cuts. So, politically he is another center-left cup of java, not a venti sensible no-(liberal)-foam latte that conservatives would drink. No doubt he’d make a better president than Trump on temperament alone. But a path to electability is difficult to see. I might feel better if he had been elected to Congress, or dog catcher. Politics requires skill beyond running employee pep rallies or selling. Government can’t be run “like a business.” This is why almost every president held previous elective office. America’s in trouble. This is the one thing both side agree on — though they disagree vehemently on what’s wrong and why. But Howard Schultz won’t be the antidote. Not in a run for president, at least. He’s healthy and wealthy, and has the options that only those gifts confer. Better to use them on other kinds of public service than a presidential run.